The long-duration storm dumped six to 12 inches, enough to set records. This was not a heavy snowstorm of typical origin — not a nor’easter, which most often delivers the memorable snow events such as Snowzilla in January 2016 and Snowmaggedon in February 2010. The weekend’s snowy blanket was the result of a more subtle interplay of weather systems that passed through in stages. 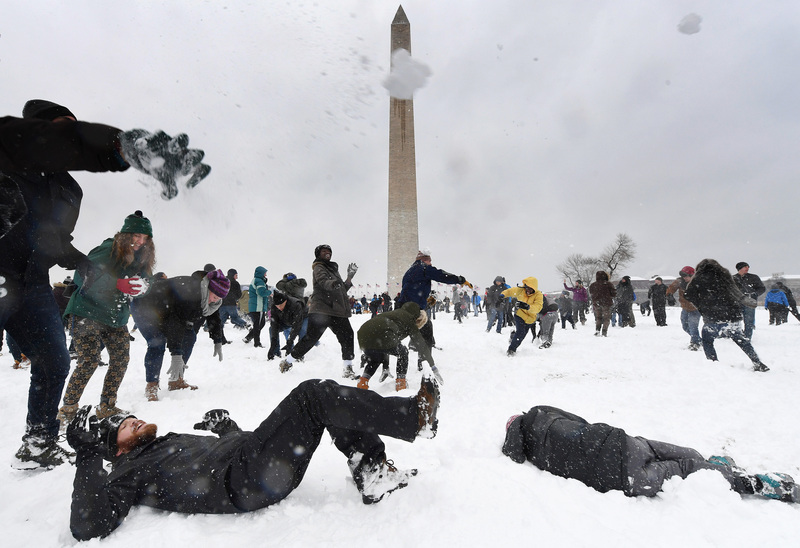 The storm earned the name “Snurlough,” due both to its heavy snow and ongoing federal government furlough. Like the furlough, this storm had staying power — snow was reported at Reagan National Airport for 35 straight hours (from 3 p.m. Saturday to 2 a.m. Monday). The snow began mid- to late Saturday afternoon and fell steadily into Sunday morning — setting down four to six inches. There was a brief hiatus during the early afternoon Sunday, allowing road crews to clear the primary and secondary roads, and folks to clear off their cars, shovel driveways and venture out. But then came a vigorous grand finale in the late afternoon and evening Sunday. It situated squarely over the D.C. region and unloaded an additional two to six inches. Road conditions quickly deteriorated again, and most schools and the federal government had little choice but to close their doors Monday. 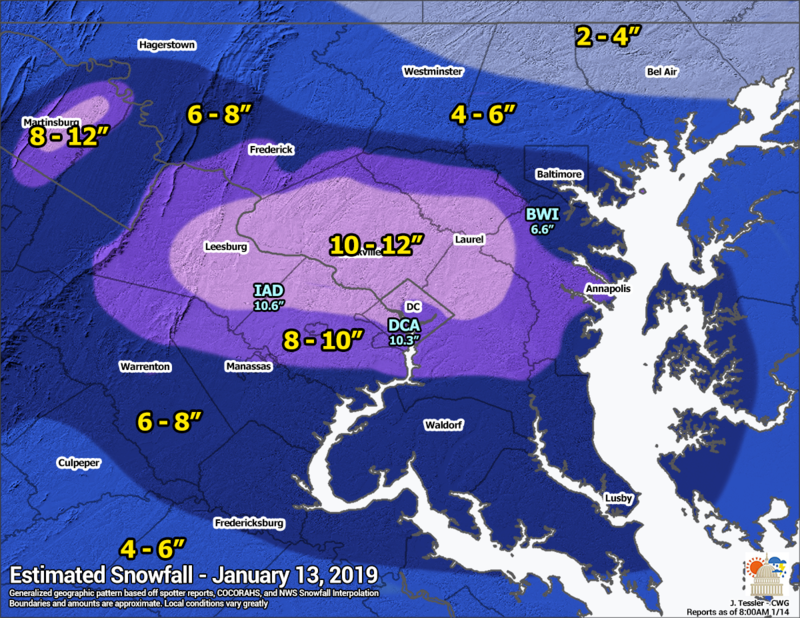 All told, six to 12 inches fell across the region (slightly less into northern Maryland). The jackpot of 10 to 12 inches fell from around downtown Washington into its immediate northern suburbs. West to east, this bull’s-eye zone stretched from eastern Loudoun County through Montgomery County and into northwest Anne Arundel County. At the airports, Reagan National, Dulles and Baltimore-Washington International Marshall picked up 10.3, 10.6 and 6.6 inches, respectively. The 8.3 inches and 7.7 inches that fell at National and Dulles on Sunday alone set daily records for Jan. 13. The storm total of 10.3 inches at National ranks as its ninth-largest January snowfall on record (hat tip to Capital Weather Gang’s Ian Livingston). It was also the seventh biggest two-day snowstorm in the past 30 years (hat tip to meteorologist Alex Lamers). What primed the pump for this heavy snow was a blast of Arctic air, arriving Thursday, courtesy of very strong high pressure moving southeast out of Canada. A piece of that pressure cell began to nose its way southward, to the lee of the Appalachians. This cold, dense wedge of subfreezing air is called Appalachian cold air damming, and it stayed put all the way through Sunday night, as shown below. 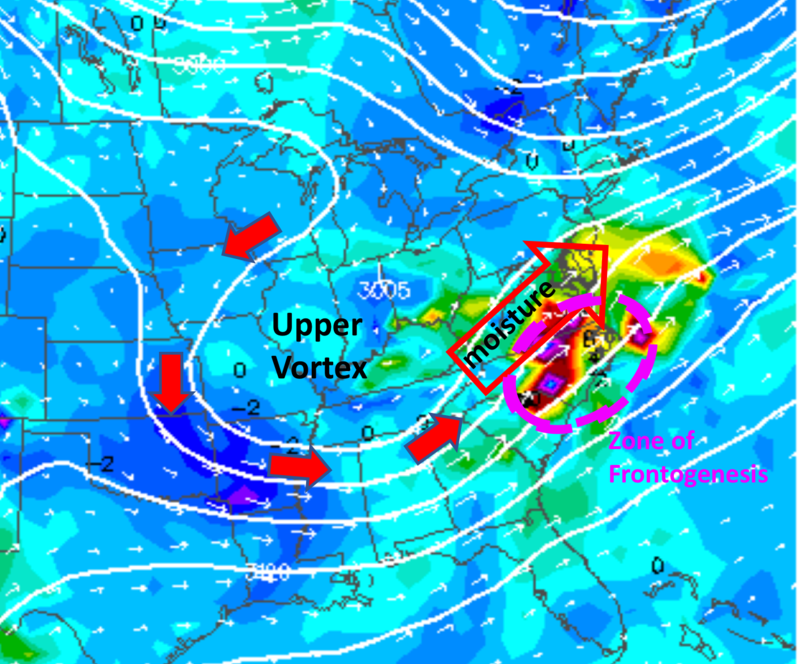 Meanwhile, over the Mid-South, a storm system at the surface was organizing, stoked by a large vortex at high altitudes. Because of the counterclockwise circulation of winds around the low pressure region, the vortex began drawing moist air from the Gulf of Mexico northward, on southwesterly winds. This deep layer of moisture was shuttled up and over the dense, chilly dome of air stuck near the ground over Washington. This is what we mean by “overrunning,” and it caused widespread clouds and then snow to develop across the region Saturday evening and overnight. Normally, steady but light precipitation ensues from these setups. There was one additional element that energized the process further, a feature of the jet stream coursing along at 30,000 feet. As shown above, there were pockets of especially fast flow embedded in that river of wind which cause streams of air to rise through an appreciable depth of atmosphere. 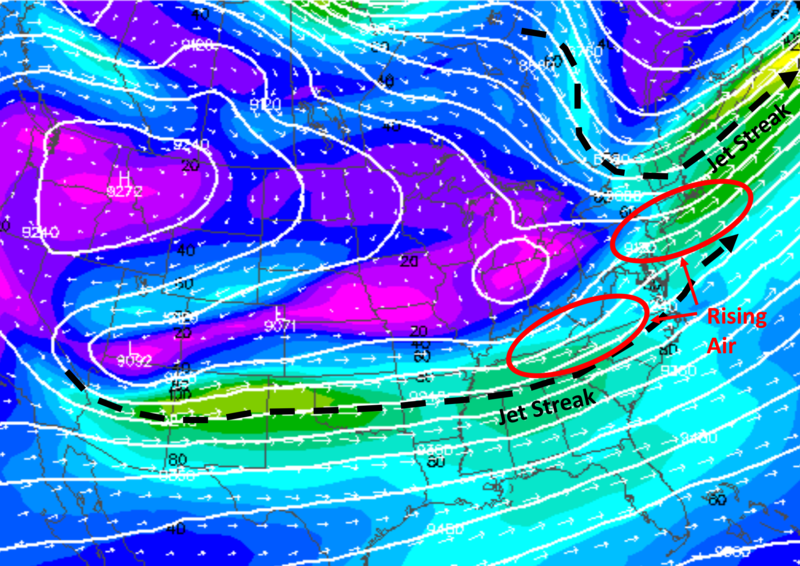 These zones of rapidly rising air, like chimneys, are circled in red. Two of these zones merged together over the Washington region Saturday night and early Sunday. As a result, the cloud layers concentrated their impetus into a more intense band of snow, causing about half a foot of snow to fall in some spots by Sunday morning. Much of that dynamic impetus was concentrated just south of the District, where a process called frontogenesis (literally, creation of a mid-level front in the atmosphere) set up a band of persistent, moderately intense snow. A coastal low-pressure zone was also formed in this region, enhancing the snow — mainly in our southern areas. Like the intermission of a play, the flakes of snow abated around noon Sunday. But CWG forecasters made it clear that a second act would soon unfold, commencing around 2-3 p.m., adding inches to the snowpile. Right on schedule, the flakes began their descent once again mid- to late Sunday afternoon and intensified to the point of surpassing snowfall rates in some locations from earlier in the day. In the jackpot area (described above), this second burst unfolded at the rate of more than an inch per hour, particularly in central Montgomery County, where thundersnow was even reported. The track of this upper-level vortex was nearly ideal for creating a surge of rapidly rising air. The moisture it had to work with, however, no longer came from the Gulf but from the Atlantic, courtesy of a new low-pressure region intensifying off North Carolina. The cold air damming was still in place, with surface temperatures clinging to 30 degrees. Plenty cold to keep snowing, and now with a new surge of ocean moisture and renewed uplift, the atmosphere let this one rip. In the upper atmosphere, there was a lot of spin, something we call a “vorticity center.” As it approached, the air was forced to rise from below. This center is shown by the red “X marks the spot” in the diagram below. Note the tiny pocket of moderate to heavy snow, locked in over the District and surroundings. No, this was not your classic nor’easter, mega-snowmaker. 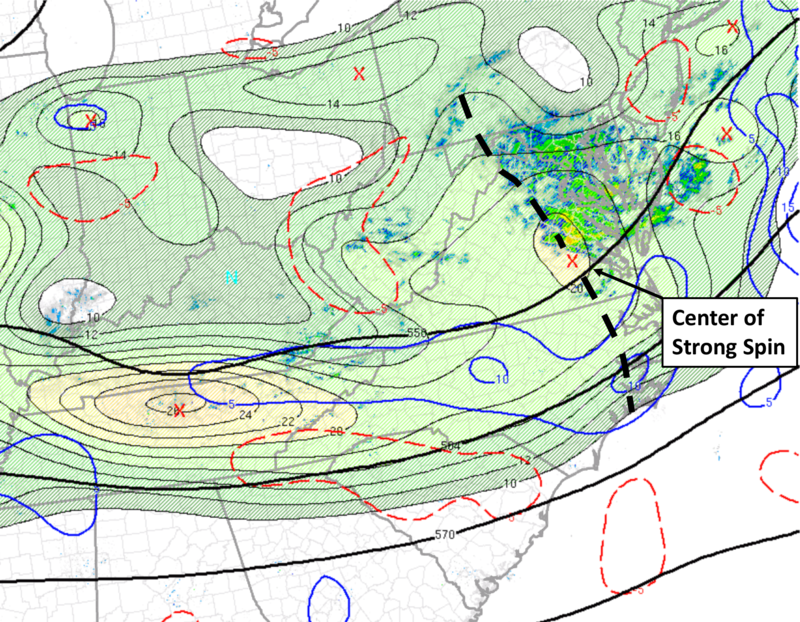 But it was a multiphase storm system that maximized over the heart of our region. If it’s the snowy coastal storm classic you seek, stay tuned, as next weekend might prove to be interesting around here! Program note: Capital Weather Gang will have forthcoming posts reviewing the forecast for this storm and examining the storm potential for next weekend. Jeffrey Halverson, a contributor to The Washington Post’s Capital Weather Gang, teaches meteorology at the University of Maryland Baltimore County. Jason Samenow is The Washington Post’s weather editor and Capital Weather Gang's chief meteorologist. He earned a master's degree in atmospheric science and spent 10 years as a climate change science analyst for the U.S. government. He holds the Digital Seal of Approval from the National Weather Association.